The kidnapping of a French priest, Reverend Georges Vandenbeusch, in northern Cameroon on 14 November 2013, barely seven months after the negotiated release of a French family who had been kidnapped by Boko Haram and Ansaru in the same region, demonstrates Cameroon’s vulnerability to the threat of global jihad. Recent actions by France seem to confirm this vulnerability. 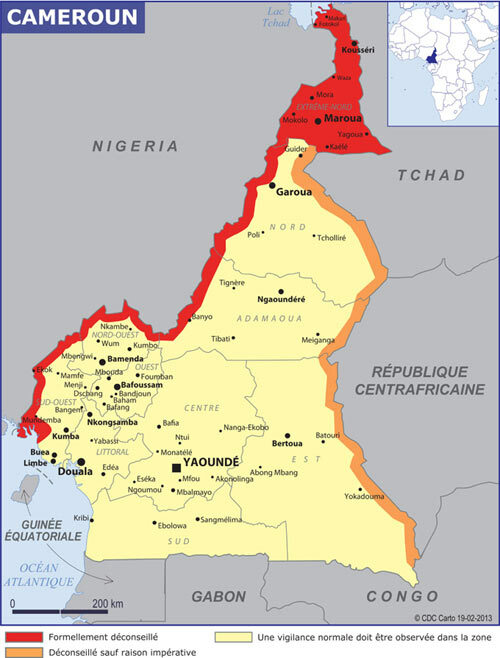 Fearing the Islamists’ growing influence, France has for the first time since Cameroon’s independence, issued a red alert travel warning, declaring certain parts of the country no-go zones (see map). This reaction has led many analysts to ask whether Cameroon, once lauded as an oasis of peace and stability in a turbulent region, is in danger of becoming another African country where terrorism has degenerated into a chronic social problem. If France’s paranoia is anything to go by, Islamists’ recent activities in Cameroon should be taken as a serious symptom of the growing insecurity in the country. Despite its relatively stable history since gaining independence in 1960, Cameroon has not been immune from the threat of terrorism. According to the Global Terrorism Database (GTD) maintained by the University of Maryland, roughly 28 major terrorist incidents occurred in Cameroon between 1970 and 2011. The deadliest attack to date took place on 12 November 2007, when gunmen in speedboats attacked a Cameroonian military post on the Bakassi Peninsula, killing 21 soldiers. Between 2011 and November 2013, 13 major terrorist attacks were reported in Cameroon. The most recent attack occurred on 16 November 2013, when unidentified gunmen from the Central African Republic (CAR) attacked a Cameroonian border post at Gbiti. Seven people died in the attack. Of the 13 attacks that have been recorded since 2011, at least eight have been attributed to Boko Haram and Ansaru, making them the principal terrorist threat to Cameroon. 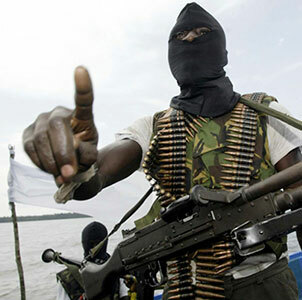 Until the recent escalation in kidnappings in the country’s far north, the places most vulnerable to terrorism have been the area surrounding the Bakassi Peninsula and the high seas linking Cameroon and the piracy-ridden Niger Delta region of Nigeria. Here Cameroon has suffered at least ten major piracy incidents in the past two years. With the civil war in CAR, east Cameroon has also become vulnerable, broadening the threat of terrorism to include all Cameroon’s borders with Nigeria, Chad and CAR. The drivers of terrorism in Cameroon may be found in the country’s complex historical, geostrategic and socio-economic dynamics. Often described as Africa in miniature, Cameroon is not only diverse in landscape but also in people. The estimated 21 million Cameroonians comprise more than 250 ethnic groups, many of which trace their roots to other African countries. This diversity also exists in relation to religion, with the population consisting of roughly 40% Christians, 30% Muslims and 30% espousing traditional beliefs. This diversity has never been a source of conflict or instability in Cameroon, but it does provide a setting conducive to the exploitation of certain groups and religions. Kinship is one of the biggest factors in the spread of modern terrorism, as ethnic and religious ties provide a base for both support and protection. The roots of radical Islam in Cameroon may be traced to the period of Islamic revivalism in northern Nigeria, which took concrete institutional form with the establishment of the Sokoto Caliphate (1804–1903). Until the arrival of the German colonial powers, most of northern Cameroon formed part of Nigeria’s Adamawa Emirate, populated by the same people – mainly the Hausas and Fulanis – and administered by the British from Lagos. It was only after the 1893 agreement between Great Britain and Germany that Adamawa was split between Nigeria and Cameroon with a formula that did not respect ethnic boundaries. As a result, the religious activism that animated the Sokoto Caliphate and particularly the Adamawa Emirate continued in Cameroon, and to some extent took a more radical turn as Muslims in those territories vehemently opposed the split and the subsequent secular regimes in Cameroon. This historical and ethnic affiliation is vital to understanding the cross-fertilisation of jihadism in Cameroon and Nigeria. For example, the Cameroonian Muhammad Marwa, who moved to Nigeria from northern Cameroon, is believed to be the founder of the Maitatsine Doctrine, an extremely radical form of Islam that spread throughout northern Nigeria and culminated in the Kano uprising of December 1980, in which over 4 000 people died. Boko Haram, which today has many Cameroonian members, espouses the Maitatsine Doctrine, which rejects Western forms of education and other aspects of Western life it considers to be corrupting. In this context it is important to ask why radical Islam has been so violent in Nigeria and not in Cameroon, especially given their geographical proximity, and historical and ethnic affinities. Indeed, the split of Adamawa and the end of the Sokoto Caliphate were met with same violent reactions in Nigeria and Cameroon. The colonial approach to Islam and the role that the latter played in the nation-building projects of the two nations, are however, different. From the beginning of the German colonial administration, Islamic militancy was identified as the greatest threat to the construction and governance of the Cameroonian nation. This view was upheld by the subsequent British and French administrations, as well as the country’s post-independence regimes. As a result, policies were developed to pacify, coerce and integrate Muslims into the nation-building project. This began with the dismantling of the religious edifices that underpinned the Sokoto Caliphate. For example, the power of Islamic theocracies, clerics and local chiefs or laamidos was reduced and made subordinate to secular institutions. Other policies have included direct negotiation and preferential treatment, as well as the monitoring and strict regulation of Islamic affairs, including state oversight of mosques. The 1984 attempted coup by Ahidjo’s loyalists brought to the fore the continued threat from the north and the gaps in the nation-building project. The state responded by developing programmes to encourage and reward cooperative Muslim elites, and created institutions to support and advance Islamic culture. Central to these efforts has been the creation of a unitary republican state that recognises plurality but does not define Cameroon on the basis of any ethnic or religious creed. The current radical Islamist threat comes from sources external to Cameroon – primarily from neighbouring countries. The pressure Boko Haram and Ansaru face from Nigerian military operations has forced the groups to look for safe havens outside the country. Cameroon is believed to be one of the countries in which Boko Haram has regrouped following the massive military crackdown in Nigeria in 2009. The group is believed to have established a comfortable berth in northern Cameroon, using porous borders, false identity cards and kinship ties to infiltrate the country. Although it traditionally used its Cameroonian bases only for resources, recruitment and planning attacks, it recently started to carry out attacks in the country, including assassinations, murders, armed robberies and kidnappings. Cameroon, which has no experience in combating terrorism, is employing conventional military tactics similar to those used by Nigeria. Last year, Cameroon reportedly killed about 180 Boko Haram fighters in such operations. Several of the sect’s fighters have been arrested and imprisoned. However, these measures are inadequate to deal effectively with the threat of terrorism in the long term. The overwhelming emphasis on military responses may risk Cameroon falling into the same predicament as Nigeria, where military responses have helped foster Boko Haram’s resistance. If Cameroon is to be successful in repelling the threat, it will have to take a robust criminal justice approach that combines sound intelligence with effective investigation and prosecution of terrorist suspects. Cameroon must prioritise the adoption of comprehensive national counter-terrorism legislation. It should also provides guidelines for both military responses and long-term measures, with a view to addressing the legal, social, political, economic, religious and cultural conditions that give rise to terrorism. Cameroon should also tighten border security, strengthen the capacity of its judiciary, eliminate corruption among the security forces, and strengthen cooperation at regional and international levels.